The Bean Factory, established in 2001, is an independently owned, local coffee shop and roastery in St. Paul. When we bought the vacant building we envisioned a specialty coffee shop serving the community by bringing only the best coffees, roasted to perfection. We are dedicated to providing our customers with the highest quality coffee beans from a variety of different countries. Each bean is carefully roasted to achieve its unique flavor profile. We pride ourselves in our knowledge of the coffees we serve. Originally roasting in a 6 lb roaster we now roast every bean on the premises’ in a 25 kilo Probat small batch roaster. This increase is largely due to the fantastic community support we have received. We serve our customers with the best possible coffee by taking orders and roasting daily to fit their needs. We serve three different coffees daily; one decaf and two regular coffees from different countries. If you don’t find your favorite coffee on the menu, we will make you an individual cup of coffee at our brew bar just ask and we will brew it for you! 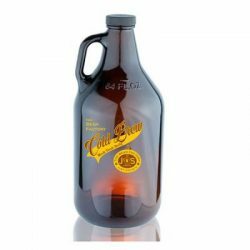 Stop in and get this beautiful growler filled with our amazing cold brew. Once you empty it out, bring it back in for a refill.